Physics needs some new running shoes, or at least an updated framework in which to understand itself so that it won't be running in circles trying to get to Saturn or a distant star in a galaxy far, far away. That's the sentiment among those in elevated levels of government as well as individuals who understand higher consciousness. Why? There are places all over the Universe we can travel to in an instant, using energetic portals in space, and the use of our consciousness. The proof is indeed mounting that there are portals to other worlds. Though the documentation is still 'sketchy' to describe how this is done in black and white, there is a trail there for those who want to follow it. There are literary hints as well as soft evidence and testimony of numerous whistleblowers. Within this framework we can look at the work of a NASA researcher who has revealed that there are portals to other dimensions that open and close every day. They are found within the earth's magnetic field, and they are in a direct line to the sun's atmosphere 93 million miles away. ...the process of magnetic resonance allows them to exist. This means that an extraordinary 'opening in space or time' does exist, and NASA has known about them for an undefined duration. These 'short-cuts' are talked about in science fiction, and often dismissed by 'real' scientists. "Places where the magnetic field of Earth connects to the magnetic field of the Sun. 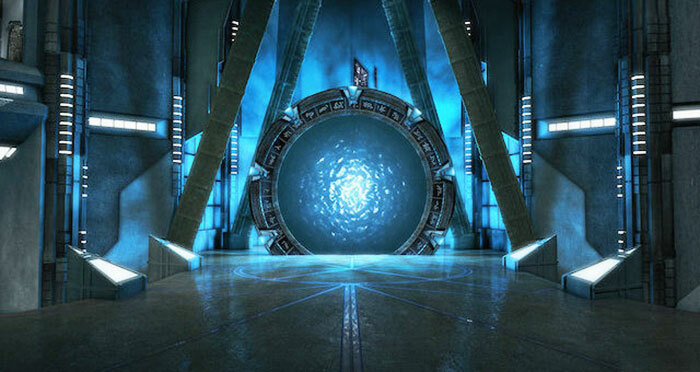 These portals can be elusive, however, so if one were to imagine utilizing them for space travel, they would have to be an expert in space geography and mathematics to time them correctly." Some claim that the military industrial complex has had the ability time travel through stargate portals for over 40 years. Basiago claims the military has been using portals since the 1970s. For more than 10 years, Basiago has been trying to tell the general public that portal-based time travel is not something from a sci-fi movie, but a present reality. Basiago states he participated in two 'secret' military programs. He says he was one of the many American children chosen to participate in time travel experiments. This is a similar question that was attempted in the movie 'Contact' staring Jodie Foster. The real life astronomer and ET chaser that inspired her character is Dr. Jill Tarter. "The Cyclops Report from 1971 - written by Barney Oliver and John Billingham - was the result of a series of summer studies at NASA Ames and Stanford. In reading that workshop report, I was impressed by the notion that after millennia of asking priests and philosophers what to believe about life beyond Earth, the middle of the 20th century presented us with some tools that permitted scientists and engineers to do experiments to try to find the answer. Telescopes, rather than belief systems, could potentially show us what is, rather than what others said we should believe. I realized that I was in the right place, at the right time, with the right skills (undergrad degree in engineering physics and Ph.D in astronomy) to join this exploration. I got hooked, and have stayed hooked all these years." That's because if alien life exists, then surely there are forms of life that are way more advanced (both consciously and technologically) than we are, and these forms of life most assuredly can travel 'in the blink of an eye' without necessarily having to overcome gravity, the limitations of rocket fuel, or even the scarcity of physical materials which could not easily withstand the heat of the sun or the extreme cold of deep space. If our minds could simply create the energy we need to travel more than 9 billion light years before we're 9 billion years old, then space travel would become commonplace. Nikola Tesla alluded to something of this nature. "Radiant energy is a form of energy that Tesla discovered that is latent and pervasive in the universe and has among its properties the capacity to bend time-space." Passing through this curtain of energy, Basiago would enter a "vortal tunnel" that would send him to his destination. There was also some kind of "holographic technology," which allowed them to travel "both physically and virtually." They weren't always safe, though. One of Basiago's cohorts, Alfred Webre, recalls one instance in which a child returned from his temporal voyage before his legs. "He was writhing in pain with just stumps where his legs had been." These bugs, according to Webre, have been ironed out in the 40 or so years since the experiments began. If our consciousness just needs to catch up to the materialization of matter, anything is possible, but we've got plenty of work to do before packing a bag for MACS0647-JD a mere 13.3 billion light years away. I'd hate to forget my wallet in Sacramento while my energy was being catapulted to this distant galaxy, let alone my legs. In Project Pegasus and the Advent of Time Travel, Andy narrates his childhood experiences of time travelling for DARPA's Project Pegasus; describes the eight forms of time travel in use by the US government by 1970; explains why children were involved in time travel; reveals what future events the US government had prior knowledge of in the early 1970's; and evaluates the policy alternatives pertaining to time travel technology. For Part 2 go here.